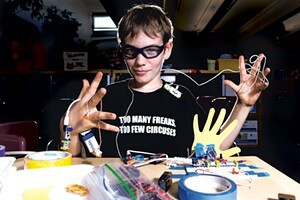 Champlain Mini Maker Faire | Shelburne Farms | Science & Nature, Nature & Science | Kids VT - small people, big ideas! Tech enthusiasts celebrate the DIY mindset at this quirky science fair featuring robotics, student experiments, arts and crafts and a brand-new evening program this year. Price: $15-20; free for ages 10 and under; tickets good for both day and evening program.